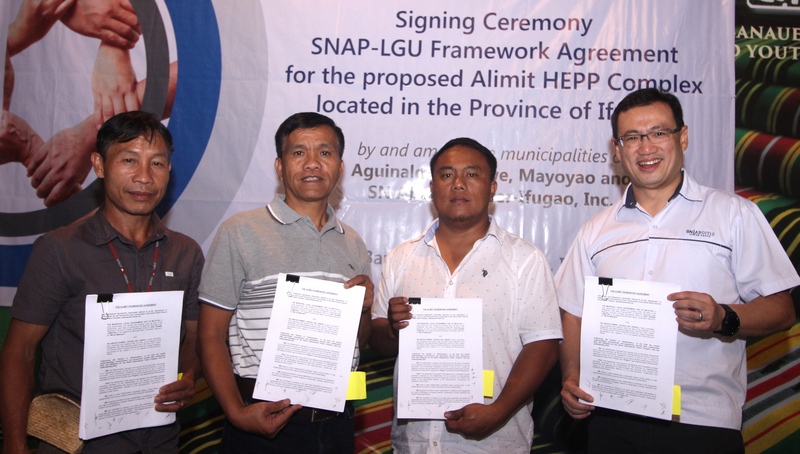 SN Aboitiz Power (SNAP) and the municipal governments of Aguinaldo, Lagawe, and Mayoyao signed a framework agreement on the proposed Alimit Hydropower Complex to be located in Ifugao province. The agreement outlines the cooperation, collaboration, and obligations between and among SNAP as project proponent and the municipalities as hosts during the development and operation phase of the project, which is undergoing permitting and further feasibility studies. It was signed on October 4, 2018 during a ceremony held in Banaue, Ifugao. Representing Ifugao in the signing were Governor Pedro G. Mayam-o, Mr. Peter Pinalgan from the Office of the Vice Governor, Aguinaldo Mayor Gaspar Chilagan, Jr., Lagawe Mayor Martin Habawel, Jr., Mayoyao Mayor Ronie Lumayna, members of the municipal council, councils of directly affected barangays, and Indigenous Peoples’ Organization officers and members. SNAP was represented by its President and CEO Joseph Yu, Chief Business Development Officer Kjell Valdal, Chief Corporate Services Officer Michael Hosillos, and members of the business development and community relations teams. “It took us four years to achieve this milestone. What we are trying to build here are a partnership and a relationship with our stakeholders. We can achieve these. If we are all willing to commit, we have a better chance of succeeding,” said Mr. Yu. The project is composed of 20-MW Ollilicon and the 120-MW Alimit hydroelectric power plants. The technical studies for the third component, the 250-MW Alimit Pumped Storage, have been temporarily suspended due to market constraints. SNAP was issued the renewable energy service contract for the project in 2014. The signed agreement brings the renewable energy company and Ifugao a step toward building the first hydro power facility in the province. Guided by the principles of “voluntariness, collectivity, generosity, preservation of relationships and unity, and empowerment, the parties have developed the agreement to operationalize the Alimit Complex’s completion and to realize the socio-economic programs that come with it, aimed mainly to fast track development and progress in host communities.